Each year SMA members gather with the family and friends of deceased SMA seminarians, brothers, priests and bishops to pray for those who have gone before us. It was also an opportunity to remember members of other congregations many SMA’s have worked with, particularly the OLA Sisters. The Remembrance Mass in Wilton, celebrated by Fr Michael Evans, was well attended. The Mass in Dublin had about 120 people in attendance. The Remembrance Masses in Claregalway and Dromantine will take place on Sunday, 11 November, at 3pm. Fr Sean Hayes SMA was the Principal celebrant at the Dublin Mass, celebrated at the Jesuit Conference Centre in Milltown. Sr Deanna Donohue OLA spoke during the Mass about the significance of the celebration. Sr Deanna had two brothers, Brendan and Dominic, in the SMA as well as an uncle, Fr Michael (ordained in 1921) and a cousin, Fr Patrick Dongohue, who served as Superior of the American Province. 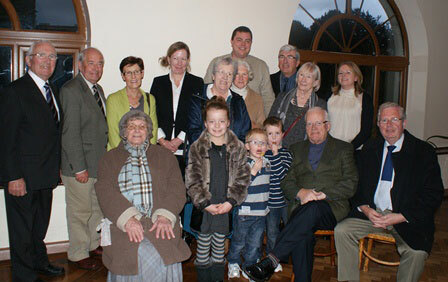 In her remarks Sr Deanna (pictured above with family members) spoke of the calling which all missionaries receive: “God called all of these men into service as priests, not because of their holiness or abilities but simply, He put His seal on them drawing them to Himself to fulfil His mission – ‘go out to the whole world and proclaim the Good News’. The Good News and the life which Jesus lived we know about from the Gospels. And this is the life which all of us, as missionaries, do our best to emulate.” Sr Deanna reminded the assembled families that, as baptised members of the church, they too have an obligation to spread the Good News of Jesus Christ. Speaking about the early years of the SMA when young missionaries died quite quickly, some within weeks or mnonths, of arrival on the west coast of Africa, Sr Deanna said that the challenges and difficulties they faced were never spoken about. “However the warm welcome of the African people, their wholehearted welcome and acceptance of the ‘foreigner’ eased their settling in.” The early missionaries travelled by foot, bicycle or boat to make contact with the villagers, preaching and baptizing… They built churches, others worked in schools, had many projects, helping out with building bridges, schools, establishing credit unions etc. Most importantly they became involved in the formation of seminarians and , more recently, training SMA seminarians from Africa”. Today there are many African clergy ministering throughout the world. So the missionary dimension of the Church is very much alive and active.